Having a hard time finding just the right designer jean? Here’s your cue! 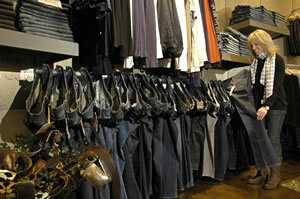 This fashionable boutique right on main street Spokane specializes in jeans and trendy fashion. From the moment you enter and walk up the white marble steps, gaze at the spectacular lighting and settle into the contemporary surroundings, you’ll know that boutique shopping was never better in Spokane! Cues is a locally owned boutique that brings in the latest fashions from L A and New York City. Some of their top designer lines include Tracy Reese, Tocca, James Perse and Woo. On another rack you will find the names of Vince, Nicholas K, Velvet and T Luxury to name just a few. These are designer lines that one expects to find in much bigger city shopping. The boutique makes a point of carrying fits and styles for a range of ages so that all their customers can find pieces that are hip and updated. Designer jeans, city jeans, go-to-work then dance-till-midnight jeans. This shop specializes in jeans! With over 30 lines to choose from, their jaunty jean rack brims with choices. 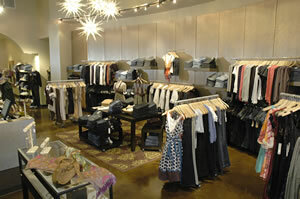 You will find top designer denim in such names as Habitual, Hudson, William Rast, Joe's Jeans, Antik Denim and Stitch's. Cues makes trendier fashion more accessible in Spokane and that’s your cue to come take a look!